The pear cut diamond, is usually referred to as a “pear shape” in the jewellery trade. This cut been around for many, many years. In fact some of the oldest cut gems in the world are of the pear shape diamond type. In the modern era of cutting, the cut has been greatly refined. Most these days are technically referred to as a “Pear Brilliant”. This is a diamond that literally punches above its weight, being one of the diamonds that is larger in spread than many other commonly used diamonds. The Pear Cut Diamond is Very Versatile. 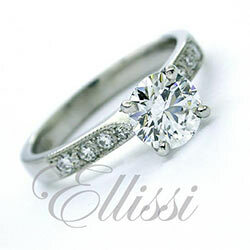 The pear shape diamond is great diamond cut for solitaire and halo design rings too. Also being a tear drop type shape makes the pear cut diamond very versatile. The tear drop shape lends itself to being used in pendants and drop earrings in particular. Pear shape diamonds can also be used as side diamonds when a matched set is selected (as shown here). Great for Three stone rings to compliment a central gemstone of suitable matching attributes, such as a cushion diamond for example. As a main central gemstone the pear cut diamond is less commonly used. This is because the shape is distinctive and quite difficult to work into as many designs as are possible in other cut shapes such as the Round Brilliant Cut. Demand for the pear cut diamond is a little less than for many of the other diamond shapes like the round brilliant or cushion cut. Because of this, the costs tend to be better, grade for grade so it makes the pear cut a very attractive option for those who like its refined curves. Considering a Pear Shape Diamond will potentially give scope for greater size for any given budget. However, as with all diamonds in the “fancy cut” designs, they all differ in some way. Selection does of course have much to do with the grades, but critically the cut proportions are most important too. Not all pear shape diamond are a great shape. Some can be too long and thin, others too rounded. Selection of “cut” is one key area not to be overlooked if you want a great looking diamond that suits the ring design you are thinking of. If you would like to have a look at some of the engagement rings we have made over the years with pear cut diamonds, click on the following link: pear shape diamond rings.